Description: The flowers are in umbel-like, terminal clusters and have 5 reflexed petals and an erect hood that extends beyond the central column. The flower buds are pink. 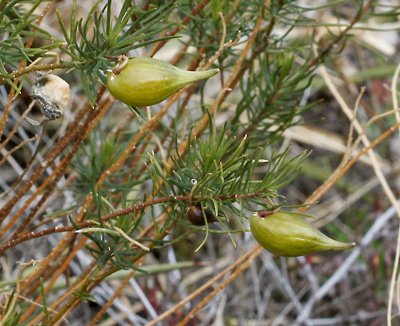 The seed capsules are teardrop-shaped and 2 inches (5 cm) long. The leaves densely line the stems and are dark green, narrowly linear, and resemble pine needles. 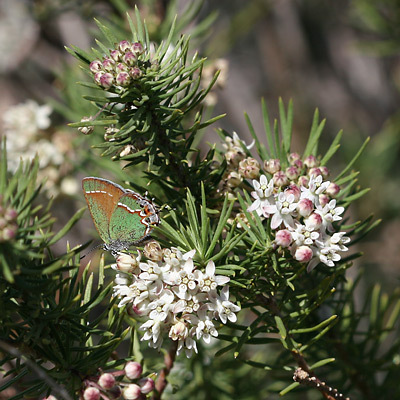 Butterfly Plant – The flowers attract butterflies, and it is one of the food plants for Queen (Danaus gilippus) butterfly caterpillars. Seeds and plants are available in native plant nurseries, and it is a good choice for sunny, well-drained xeriscape or butterfly gardens.